Not many people write books about eels, I can’t think why. Personally, I think they are wonderful fish, as long as they aren’t attached to my line. In the abstract, I am an eel fan – I have always been fascinated by their heroic journey, all the way from the Sargasso sea to wherever. I mean, why do they do it? Why should nature, evolution, God, whatever, have decreed that salmon should spawn in freshwater and journey thousands of miles to sea to feed; and eels do precisely the reverse? Is it some kind of prank perpetrated by the fates that there should be two such radically different solutions to the same problem? Or is it that eels and salmon don’t get on when they are mating and it is better for us all to position them at the far ends of the earth? 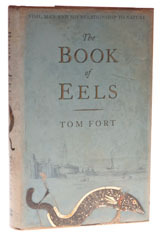 Clearly, I am not the only person to have wondered about these puzzling facts, and Waterlog’s Tom Fort has not only worried about them, but gone out and tried to establish what eels are up to on their mysterious journeys to and fro on the dark nights they favour so. Quite apart from having a drop-dead gorgeous cover design, the book is packed with amazing facts: did you know, for example, that no-one is quite sure whether adult European eels definitely make it back to the Sargasso? Yep, it is a possibility that all our native stock is derived from American spawn and only goes East thanks to subtle temperature variations. Did you also know that no-one is precisely sure where eels spawn, beyond a general knowledge of the area; and that the research that we base our knowledge of their migrations upon isn’t quite as certain as we are encouraged to believe? Or that the right sort of elver sells for much the same price as gold? Or that if you don’t buy this book for Christmas, you ought to be encouraging someone else to do so on your behalf? Just a thought. The review was of the hardback, but The Book of Eels was still available at a considerable saving as a paperback in 2011; the next step is Steve Ricketts Eels, which will teach you how to catch them.